Last week I attended and presented at the conference organized by Kitchener Waterloo Software Quality Association. 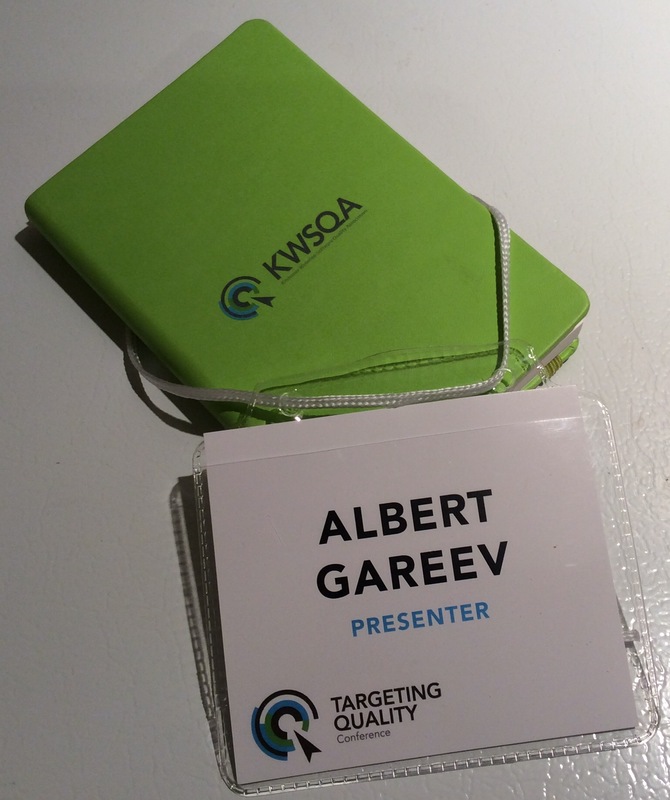 The conference theme (as announced) was “Targeting Quality”. I found that the focus was specifically on the quality of testing rather than software quality in general. And this is good! Product quality is a result of collaborative effort of all developers (i.e. programmers, testers, DBAs, environment and release management specialists, as well as project and product managers). As testers, we must constantly look for ways to improve quality of our work – how to find problems that matter, critical thinking, learning about the context, effective communication, and craftsmanship and courage above all – as highlighted by Fiona Charles in her keynote. Based on the talks I attended, and people I met, and the whole spirit – the organizers sure met the purpose! Based on the numbers published online. Over 100 attendants for 3 full day workshops. Over 200 attendants for 16 talks on the second day. As per my own impression: all sits were taken! There were presentations where additional chairs had to be brought. Attendees were a very active crowd. People tweeted, discussed, commented, asked questions. Full schedule is published here. The Battle For Our Hearts And Minds – keynote by Fiona Charles. Black Box Accessibility Testing: A Heuristic Approach – presentation by Albert Gareev. Show It! : Better Testing through Visual Communication – presentation by Jess Lancaster. My Life as a Practice Manager – Erik Davis. Testing In The Land Of Make Belief – Robert Sabourin. There was also non-stop conferring before, in between, and after the talks! It was a high quality content. I liked CAST very much, and I liked KWSQA 2015 very much. I received a memorable experience listening to and learning from the talks, and I had a good experience as a presenter. I’d say this event was a great success in terms of meeting of the purpose, organization, and performance. My thanks to the organizers, presenters, and everyone who came! I also got a pleasant surprise at the end – a gift card to the presenter. Of course, I didn’t pay for attendance on the presentations day. As for the workshop day, I had to pass on it due to family commitments. Otherwise I’d attend it; the price is reasonable for such a good quality content. Since I’m in between of contracts, time cost for preparation was insignificant for me. As for the travel cost – it happened to be higher than I expected due to road works and heavy traffic. It took me double time to get there (from Vaughan) and almost triple time to get out. Responses to my important requests were fast and concise. All changes were announced timely. The organizers provided instruction for traveling, parking, and other accommodations. Including detailed map how to navigate to the hotel and warning about road works in the city. The registration was fast, friendly, and efficient. Food and drinks service was well organized and of good quality. Based on my own talk and talks I attended, having 15 minutes more for Q&A discussion at the end would be good. Alternatively, break time (was 15 minutes) could be doubled to give time for questions to presenters and conferring with each other. Each presenter was offered help in setup and preparation. The sessions were informally facilitated. It was a regional conference based in Kitchener. Living in the Greater Toronto Area, I just needed to drive for an hour (though were traffic problems, as I mentioned). As I heard from other attendants, they also used train and air travel to get there. Since I didn’t stay in the Crowne Plaza hotel I can only comment on the overall access and meeting rooms. I found convenient that there were multiple ways to access parking, and multiple parking options. The reception was easy to get to from the underground garage. Meeting rooms were comfortable, well equipped, and placed. Overall, it was a 3 days opportunity. Wednesday to Friday, October 7th-9th. Test Retreat organized by Matthew Heusser. The schedule was well organized. As I mentioned, it felt like people need more time for conferring in between of the talks.